This fascinating work of fiction deals with John Clare, the peasant poet, Alfred Lord Tennyson, the Poet Laureate and their relationship with Doctor Matthew Allen and many others, patients and family, living at or visiting his asylum in Epping Fields. The book is divided into 6 sections starting with Fall and continuing through about 18 months, Winter, Spring, Summer, Fall and Winter again – more on this in the Page 3 section of notes – The main action takes place between 1837 and 1841, after Tennyson had published but before he was famous, and when John Clare and Doctor Allen were having their own kinds of troubles. Within each chapter, or part, several characters are repeatedly featured with their own mini-sections. John Clare, the peasant poet who died locked up, a drunkard. Alfred Tennyson and Doctor Matthew Allen each have many sections, or walkons in the sections of other characters, as well as Dr. Allen’s daughter Hannah who has a huge crush on Tennyson. Margaret, a patient at the asylum, has several sections. I rather enjoyed the slow pace of this book with each character slowly unraveling his/her story. 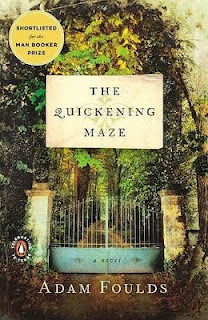 There was a plot of sorts toward the end but it really took a long time to get the characters defined – “quickened.” The setting is the lovely Epping Forest which Fould used for intensely poetical moments, especially when dealing with Clare. The poetry of both Clare and Tennyson is used throughout. The inspiration of poets is not always natural or sane, however – for whatever that’s worth. There are so many themes, it was fun to do the historical annotations but the reader has to be struck by the issues of sanity vs insanity, man and the natural elements, freedom vs confinement, change and the age of science and the industrial revolution, various forms of love, desire, delusion, the evolution of literature, and more.